Become A Sponsor - "TEAM BESSIE"
The Air Race Classic gets wide-spread publicity and encourages women and young girls to learn to fly while celebrating aviation history and women's accomplishments. We invite you to partner with us by becoming an individual and/or business-corporate sponsor to help defray the expenses associated with Air Race classic participation. Every donation or contribution will be publicly acknowledged on the "Meet Our Sponsors" page. Individual, business-corporate donations of $100.00 or more, will have their logos displayed on our race aircraft and/or advertised on the website, and recognized in the ARC program guide. Fuel is the LARGEST expense encountered during the air race because your engine is running at maximum power for the entire race, i.e. more power = more fuel. Average cost for fuel is $5.25/gal. Any contribution towards our fuel requirements will be greatly appreciated!!! With the intensity in which the Air Race Classic is flown, it is inevitable that these air machines will encounter maintenance problems, i.e. planes break during Air Race Classic. And when they break, they must be fixed in order to continue to "compete and complete" the race. Your assistance in this area will ensure we make it to the finish line in grand form. Would you consider contributing to our maintenance fund? We REALLY do appreciate your help!!! From start to terminus, the aviation charts and airport facility directories (AFD) will get us where we need to go. They are critical to our success in staying on course, flying to the correct airports, and identifying any obstacles we may encounter along the route. Help us make it to each and every airport; consider donating $8.00/chart or $4.50/AFD. Thank you so much!!! After flying demanding race legs that average 237nm, a good night's sleep in a comfortable bed, at the end of a long day is much deserved and very welcomed. 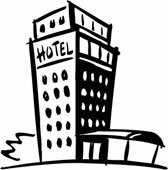 Specific hotels at each stop have been contracted and are designated/authorized hotels at which race participants must remain over night (RON). Average room rate is $100.00/night per team. Thank you for helping us to have pleasant dreams after a grueling race day :-)!!! 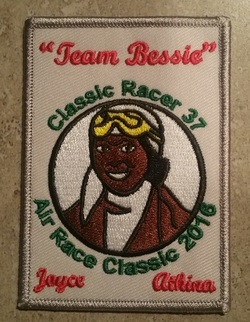 The "Team Bessie" patch is a great way to be reminded of this historic endeavor Athina and Joyce are participating in. It's also another means whereby you may have a share in supporting us financially. For a generous donation of just $10.00 (+ $1.25 s&h), we'll be happy to send you our team patch where you can remember this air adventure along with us for many years to come. Many thanks! c/o "Team Bessie - Classic 37"
A detailed accounting of all donations received will be maintained. Any contributions over and above that needed to cover our air race expenses, will be donated to the Bessie Coleman Foundation Aerospace Leadership Academy and Pilot's for Christ International. Thanks again for partnering with us!! !